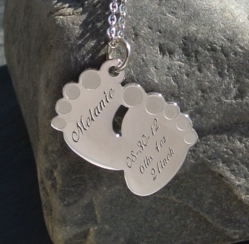 This Happy Feet necklace pendant can be custom engraved with the names and birth dates of children. With the Happy Feet pendant you can be sure to always keep your loved ones close to your heart. Our custom engraved stainless steel I.D. necklaces are crafted with High Polish 316L Surgical Stainless Steel; the highest grade of stainless steel used in the jewelry market. It is fantastic at resisting fade, blemishes and rust. It is 100% resistant to corrosion. It will not fade, change color or leave stains on your body. It does not require any maintenance to keep it looking new! Feel free to wear it outdoors, during sports activities (hiking, running, swimming, etc. ), or in the shower without having to worry about keeping its luster. The stainless steel we use for our high quality I.D. bracelets is the most worry-free and maintenance-free material for jewelry.